The Highway Department strives to meet the growing needs of our community with the maintenance of our streets and roads for the safety of our families, children and those who pass through. Our Highway Commissioner is Kim Kiesgen. Serving 26 years with the Department. She is actively working on construction and maintenance of 60 miles of township roads. With an unyielding "can-do" attitude, not to mention her personal touch with people, she is never bored managing the day-to-day operations, keeping up with the considerable variety of responsibilities the Department takes on. In order to protect the water quality of our streams, the MS4 communities in Illinois are required to develop a Storm Water Management Program for their community. These state mandated plans include recommendations and requirements for best management practices to help prevent stormwater pollution. We encourage you to browse this website to learn more. Stakeholder/Planning Committee � Fish Lake Drain Watershed Management Plan and the Squaw Creek Watershed. (NPDES) National Pollutant Discharge Elimination System. Responsible for the development and implementation of our storm water program. Spring clean-up � removal of winter�s leftover sand from the roads. A pavement sweeper and a crew with brooms use many hours to accomplish this job of sand removal. Road repairs � freezing and thawing plays havoc with roads so spring always means road repairs. Resurfacing � rebuilding roads � curb & gutter. Drainage, storm sewers and culverts maintained and replaced in some areas to ensure proper drainage and prevent right-of-way flooding. Tree trimming and removal (ongoing projects). Roadside trash pick-up � takes a lot of time and manpower. Caring for approximately 500 streetlights and maintaining traffic signs. Assist families involved in flooding and storms with sand bagging, pumps, and debris clean up. Mosquito Abatement Control Program for catch basin/storm sewers, ditches, etc. 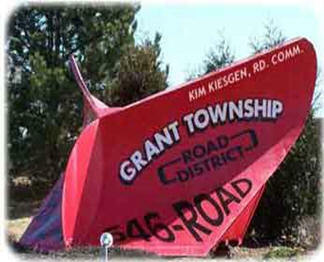 � 2005-2015 Grant Township Center. All rights reserved. Page last updated: February 06, 2019.